"[In] the highlands of the central Sahara beyond the Libyan desert,... in the great massifs of the Tibesti and the Hoggar, the mountaintops, today bare rock, were covered at this period with forests of oak and walnut, lime, alder and elm. The lower slopes, together with those of the supporting bastions — the Tassili and the Acacus to the north, Ennedi and Air to the south — carried olive, juniper and Aleppo pine. In the valleys, perennially flowing rivers teemed with fish and were bordered by seed-bearing grasslands." About 7,500 years ago Lake Chad was 130 feet deeper than it is today and covered an area of about 135,000 square miles (350,000 sq km). The footprint of ancient Mega-Chad has been confirmed by satellite photography. The Nile waters swelled from increased rainfall and cut a deeper and wider floodplain, extending well into Sudan to the west. According to Souley Garba, who discovered the twin pyramids and sphinx in Niger, the ancient map of that area drawn by the Egyptians was a long-horned cow. Clearly, the Egyptians knew Niger, Chad and Sudan to be a cattle rich region. The Proto-Saharans venerated such cows. They imagined that the Y of the horns was a cradle for the sun, and they regarded the sun as the Creator's emblem. The Y indicated a divinely appointed individual; a person overshadowed by the sun. That is why many Biblical rulers have the initial Y in their names: Yaqtan (Joktan), Yishbak (son of Abraham by Keturah), Yitzak (Issac); Yishmael (Ishmael), Yosef (Joseph), and Yeshua (Joshua/Jesus). 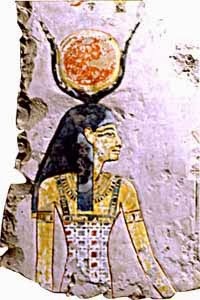 Hathor, the mother of Horus, is shown with cow horns cradling the sun. This indicates that she conceived Horus by the overshadowing of the Creator. Hathor and Horus are expressions of the earliest Messianic expectation among Abraham's Nilo-Saharan ancestors. Hathor's totem was the cow and she is shown in Nilotic shrines holding her infant in a stable. According to some stories Horus was killed by his brother and rose again. Horus is said to have died on the 17th of Athyr. On the third day, the 19th of Athyr, there was a celebration of Horus’ rising to life and this was accompanied by the sowing of grain in the fields. Jesus alludes to this when describing his passion and resurrection. “Truly, truly, I say to you, unless a grain of wheat falls into the earth and dies, it remains alone; but if it dies, it bears much fruit" (John 12:24). He identifies himself as the "Seed" of Genesis 3:15. The Horim who lived in Palestine tended sheep because the terrain is less hospitable to cattle than the broad grasslands of the wet Sahara. So the Christ is called "Lamb' of God in Scripture. However, Abraham's Nilo-Saharan ancestors were cattle herders, and for them the image of the divine sacrifice was the "Calf" of God. This is the meaning behind the account of the Golden Horus Calf fabricated by Aaron (Ex. 32). The Deuteronomist Historian either to not understand this, or in his iconoclastic fervor, rejected it. The veneration of cows in Hinduism can be traced to the earlier Harappa civilization that recognized Horus as father. Har-appa means "Horus is father" in Dravidian. Images of Horus and solar boats have been found as far east as Cambodia. 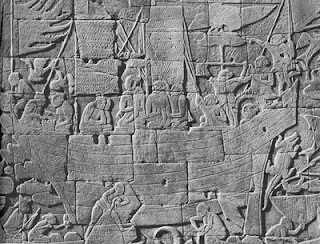 The Nilo-Saharan religious images dispersed across the ancient Afro-Asiatic Dominion which extended from the Benue-Niger River Trough to Cambodia. This stone relief at Angkor Wat shows a solar boat with the falcon image of Horus flying above the flames of the sun (shown above). This is evidence that the Horite religion spread from the Nile to distant lands. Abraham's Nilo-Saharan ancestors spoke some languages that are now extinct, including Horo. They worshiped Ra and his son Horus. They imagined that the sun as a solar boat upon which the Creator made his daily journey from east to west. 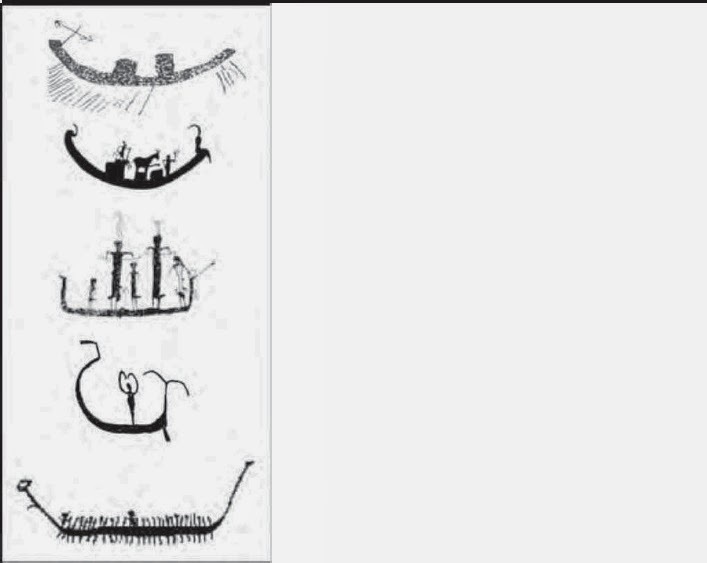 Ra's solar boat was a common image along the ancient Nile and the boat is patterned on the boats that were used by the ancient Nilo-Saharans. 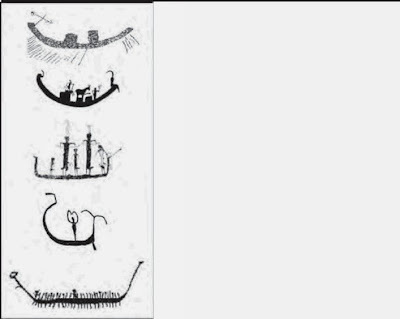 The boat shapes are displayed on prehistoric Saharan petroglyghs. Cows appear on the boats, as in the second image. Examples of sickle, incurved sickle, square, incurved square and flared boat types as found on the prehistoric rock art of the Central Eastern Desert of Egypt.